Statue of Neptune, 2nd century AD, Prado Museum, Spain. Neptune (Latin: Neptūnus) is the god of water and the sea in ancient Roman religion and mythology. His Greek equivalent is the god Poseidon. The Roman conception of Neptune was mainly influenced by the Etruscan god Nethuns. Neptune was associated with fresh water as well as the sea, while Oceanus was the god of the world-ocean. 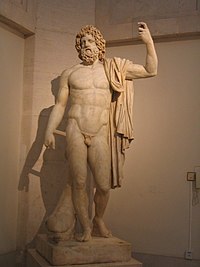 Like his Greek equivalent, Neptune was also worshipped by the Romans as the god of horses, and, under the name Neptune Equester, he was a patron god of horse-racing. The planet Neptune is named after this Roman god. Wikimedia Commons has media related to Neptune. This page was last changed on 19 March 2019, at 23:47.